This walk-through illustrates how to convert a legacy image analysis algorithm implemented in MATLAB into an analysis module that can be executed by the OME analysis engine against images and meta-data stored in OME. OME must be installed with the optional OME-Matlab connector enabled and you must have a license to execute MATLAB. Before you do anything else, we strongly recommend that you backup your database. This will allow you to recover should anything unexpected happen. This is especially important if you are performing active development with risky, irreversible operations such as importing analysis modules and chains. You need to be familiar with the advanced features of the web-ui and ome command-line tool. Please don't proceed without reading those pages first. Once you've got OME up and running, you're ready to try to execute the Histogram Equalization Test Chain. This chain takes a gray-scale image and normalizes its contrast by applying the MATLAB command histeq (from the Image Processing Toolbox). 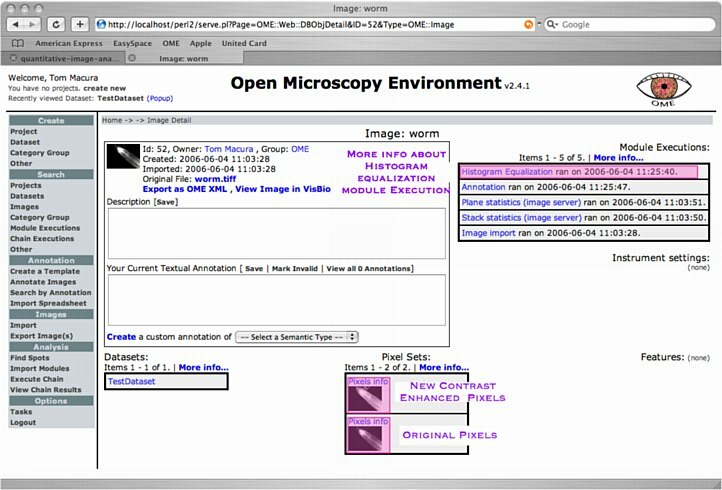 The HistogramEqualization.ome OME analysis module is a wrapper for histeq and HistogramEqualizationChain.ome is a driver feeding pixels into the Histogram Equalization module. If your OME install already contains a dataset of images, you may skip this step and replace the suggested name TestDataset with the name of your actual dataset in subsequent steps. You will need src/xml/OME/Tests/HistogramEqualizationChain.xml and src/xml/OME/Analysis/Filters/HistogramEqualization.ome. These files are provided in the OME distribution but you can also download them using the links above. Import the module and chain. Because the module is referenced in the analysis chain, the module must be imported first. [ome.grc.nia.nih.gov:~] tmacur1% ome execute -d "TestDataset" -a "Histogram Equalization Preprocessing Chain"
After the Histogram Equalization Chain has been executed, the contrast enhanced pixels are accessible through the Image's Web-UI's ObjectDetail view. You can look into the Histogram Equalization Module's ModuleExecution view to learn additional information e.g. whether there were any warnings from MATLAB and how many seconds it took to run the module. To learn more about how to write a OME analysis module wrapper around a MATLAB function read the Analysis Module XML page, and the MATLAB Handler white-paper. You can write the analysis chain in XML directly. The steps for executing a ready-made analysis chain and module are exactly the same as executing a module/chain that you've written yourself. Please email Tom (tmacura AT nih DOT gov) with any questions/problems you encounter have. Comments are very much appreciated.